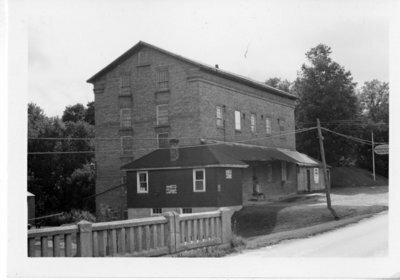 Black and white photograph of the flour mills in Brooklin. The Brooklin Mill was built in 1848 by Robert Campbell and is considered one of Ontario County's first flour mills. The original mill was a rectangular shaped building made out of brick. It operated as a mill from 1848 until 1991. In 2002 the Brooklin Mill Montessori School opened in the old mill. Brooklin Mill, ca. 1970, Brian Winter. Whitby Archives, A2017_016_001.